A diagnosis of mitochondrial disease can, understandably, be devastating. There will be many questions and emotions. This page is aimed at providing information and support for New Zealanders affected by 'mito', along with their family and friends. A diagnosis of mitochondrial disease? A diagnosis of mitochondrial disease can, understandably, be devastating. There will be many questions and emotions. This page is aimed at providing information and support for New Zealanders affected by mito, along with their family and friends. We all have mitochondria. 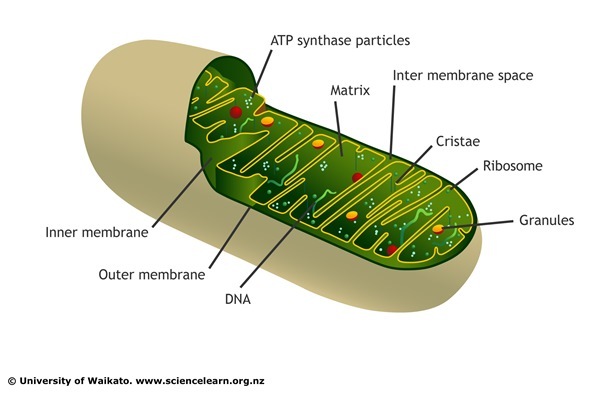 Mitochondria are found in every cell in our body. They are the tiny parts of our cells that are responsible for making energy and are known as the 'powerhouse' or battery of the cell. Mitochondria are necessary for growth and development. They create energy for our body and allow the body to perform basic functions like breathing, talking, walking and moving. When they work correctly they are the powerhouse for our body. When they don't work, the body has a power failure and major organs begin to shut down. This power failure is called mitochondrial disease. Mitochondrial disease or mito is caused when our mitochondria are faulty and therefore unable to produce enough energy. This can result in damaged cells and sometimes organs beginning to fail. It is a degenerative disease that usually targets the parts of our body that require the most energy that are affected such as the brain, heart and muscles, but any organ system at any age can be affected. At present, there is no cure for mitochondrial disease. Adults may present with early onset diabetes and multiple miscarriages. A person with mito may look 'normal' but face great challenges and potential health issues due to their condition. All of the proteins in our body are made from our DNA - our genetic material that makes us human. We have 2 lots of DNA in every cell. Our nuclear DNA (nDNA) which we inherit from our parents. There are over 20,000 genes in our nDNA; each gene has a different job to do. Over 1,000 are involved in helping the mitochondria function. Mitochondrial DNA (mtDNA) which is passed down from our mother as only the egg contains mtDNA. This is a ring of DNA found in every mitochondria. Many symptoms of mito are similar to those of other illnesses - and symptoms may be erratic, making the journey to diagnosis difficult. Sometimes a specific diagnosis cannot be achieved. There is no easy test to detect mitochondrial disease. Clinical features and biochemical blood and urine tests can strongly suggest mitochondrial disease. DNA tests and/or muscle or liver biopsies are usually required to confirm it. Sometimes, because not a lot is known about the disease, a specific genetic diagnosis cannot be achieved so a diagnosis of mito is made on the basis of a number of clinical, radiological and biochemical features. Our understanding of the genetic basis of mito is growing all the time. Is there any treatment for mitochondrial disease? There are currently no medically approved treatments for most forms of mito. Some people can respond very well to certain vitamins however for most, treatment is about diagnosis, care, support, symptom management, and genetic counselling. Care includes hydration, nutrition, adequate rest and vitamin supplements. Some people with mito have certain triggers for deterioration, particularly stroke-like events. Maintaining good nutrition, avoiding sickness and certain medications can be factors that help people stay well. 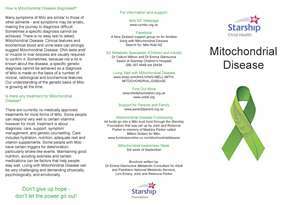 Living with mitochondrial disease can be very challenging and demanding physically, psychologically, and emotionally. The New Zealand metabolic specialists (children and adults) are Dr Callum Wilson and Dr Emma Glamuzina, based at Starship Children's Hospital. Phone: 64 9 307 4949 ext 25434. Don't give up hope - don't let the power go out! The content on this page is based on the pamphlet Mitochondrial disease (PDF, 832KB), written by Dr Emma Glamuzina (metabolic consultant for the adult and paediatric national metabolic service), Levi Emery, John and Rebecca Parker. 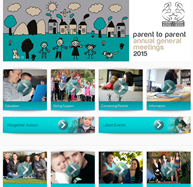 A New Zealand support group on for families living with mitochondrial disease. Search Facebook for: Mito Kids NZ. A book written for patients and their families takes readers from understanding how the mitochondria work, how people with mitochondrial defects are diagnosed and treated, to how to live well when you, your child, or someone you love is struggling with disabling symptoms. The Lily Foundation was founded in Lily's memory, having lost her battle to mitochondrial disease at just 8 months old. The charity aims to give hope, answers and support to the many other children and families that face the challenges of this disease today. The United Mitochondrial Disease Foundation promotes research and education for the diagnosis, treatment, and cure of mitochondrial disorders and to provide support to affected individuals and families. This page last reviewed 10 May 2016.